CONGRATS! Someone has moved into the new mansion in Carcosa on Feb 25, I'm told. Sorry, no new pics. If anyone has a photograph of the beautiful new home, please send it over, thank you. The Malay Mail broke the story about this "mystery mansion" in Dec 2009. I blogged about it H E R E.
duit aku bayar tax pun ada dalam kos buat rumah tu dan aku tak halalkan nya. pasang lah 200 aircond, tetap tak selesa nanti kau rasa. if it was build through unethical means, be it the mansion of the god, i hope it will be a painful reminder to the normal rakyat. and me as a rakyat will always pray May god have mercy on those houses in carcosa, ameen. My father-in-law's house lor Rocky. I will soon have an open house and invite all the press, okay. Mansion is for Dollah the Conman! No small achievement for someone who does nothing but sleep on the job all the time! Marrying his maid with Tunships thrown in for both, for respectability of course. Having a 'beruk' for a SIL who does not have to have a job to be filthy rich. Fook, all these at the expense of all the taxes I pay? Double fook! Mungkin ada Open House Hari Raya tahun ini by the owner who would reveal himself to the world. Why so busuk hati when it comes to Pak Lah? How much did Najib's house cost? And how much has Najib and family accumulated in wealth all these years. His brother Nazir-from takda apa - become one of the richest man in the country. So did Tun M's son. Tiba-tiba they all got business acumen. From where meh? Instant millionaires! I received a letter from LHDN yesterday and the letter reminds me that I have not paid outstanding income tax amounting to RM993.16. The letter warns that If I don't pay the amount on the March 11, 2011 court action could be taken against me and I could be barred from going abroad. 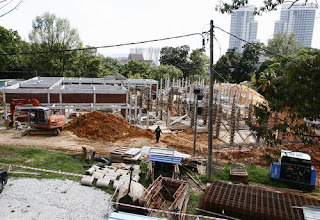 Maybe the government needs the money so badly to pay the contractor who build the RM12 million mansion. This is the fate of ordinary people like me and thousands others. I get salary every month which is hardly enough to feed my family. I support both my father and mother who are in the 70's then LHDN threaten with court action if I don't pay the outstanding tax. By the way Dato, I am from Miri and the cost of living here is very high. The state election is on April 9 and after getting a love letter from LHDN I know who to vote already. A lot of the world has overtaken us because we have inherent flaws in the way things work in Malaysia. We still want to buy cheap pirated DVDs and pay our fines undertable on tehe spot. yet we expect clean politicians. We still look at our neighbour as unequal. Yet we brag to our tourists we're tolerant and multiracial. The majority of malaysians havent the slightest idea what racial tolerance is beyond our propoganda. We look up to leaders who we know are corrupt, whos families are all billionaires (i challenge you to name a high ranking minister regardless of race in the ruling government who isnt filthy rich. This by the way isnt normal in developed countries)and run to kiss their hands and carry their balls. Therefore it will always be at a disadvantage on a global scale. Even if there were individual citizens who wanted to improve things by cutting out simple vices, they would fail because the people of the country arent ready. Mahathir once said Malaysians dont return because they dont get paid well. smart economically valuable malaysians will not return in significant numbers until we come close to what a normal developed country should resemble. It isnt always about the money. The honest, smart, hardworking ones worth their salt will continue to leave. We are not ready. Dont blame BN for plundering because we put them there. dont blame the oppositions toothlessness because we put them there. We caused this ourselves. We let it happen and did nothing. Not the malay, chinese, indians. its us malaysians who allowed this to happen. That looks like a big lot.